The Renaissance Club 15th Annual Bowlathon! The Renaissance Club members and staff would like to invite you to participate in our 15th annual ”Bowl for Mental Health” (15 Years of Changing Lanes and Changing Lives) Bowlathon as a team captain. This event will be on May 17th 2018 from 1 to 3pm. It will take place at The Brunswick Zone, 647 Pawtucket Blvd., Lowell, MA. The annual Bowl for Mental Health is a celebration of National Mental Health Month. If you accept our invitation you will be responsible for developing and overseeing a team of five bowlers, including yourself, and ensuring that your team reports to Brunswick Zone by 12:30 PM on the day of the event to select shoes, submit sponsor sheets, and turn in donations. Bowlers will use the official 2017 Bowl for Mental Health sponsor sheet. Completed sheets and pledges can be submitted before the Bowlathon to the Renaissance Club or on May 17th at Brunswick Zone with checks written to Renaissance Club. Businesses and individuals can sponsor an entire team for $500 and get credit for that team’s sponsorship. Otherwise, each bowler is strongly encouraged to raise $100 in sponsorship money, with each team raising $500. Each team is encouraged to create a team shirt, perhaps with a logo. 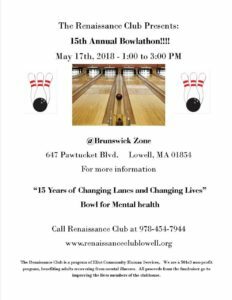 The Bowlathon is sponsored by Brunswick Zone and benefits Renaissance Club, a 501c3 nonprofit for adults living in Greater Lowell who are in recovery from mental illnesses. We are a program of Eliot Community Human Services. Our tax id # is 04-1234567. Please call Elaine Walker at 978-454-7944 during the week if you would like to organize a team, bowl with an existing team, obtain a Bowl for Mental Health sponsor sheet or make a contribution. We look forward to hearing from you and let the bowling begin! !